View photos from 2019 CalDay in Physics here. What a great day is was! The full schedule of CalDay 2019 events in Physics is listed below. Come visit our table at the Information Marketplace to learn about a major in Physics! The Society of Physics Students will be there with some great demos! Brief individual meetings with Physics Undergraduate Advisors who will answer your questions about the program, requirements, academic opportunities, & life as an undergrad. Undergraduate students discuss their experiences and current research in Berkeley's physics department. Learn about resources available to undergraduate physics majors: physics student organizations and graduate school information. Attend this panel discussion to hear an overview of the physics major at Berkeley. Tours meet and depart from the courtyard/breezeway between Birge Hall and New LeConte Hall (except where otherwise noted). Each tour departs promptly at the time listed and lasts approx. 30 min. See where our upper division students conduct hands-on experiments. Explore research into the new materials that will shape our future. See how and why physicists make and measure materials. Watch researchers use their atomic gravimeter. Interactive exhibits for all ages led by Physics students. Supports science, student education and research. Live 3-D polymer printer demonstration! Live demonstration! Showing of multi-axis machining centers and wire electrical discharged machine (EDM). Come hear about some of the interesting things that Berkeley physics students are doing: Building quantum computers, looking for dark matter, studying antimatter, and even more interesting things! Learn how researchers' observations of the Cosmic Microwave Background Radiation contribute to our understanding of cosmology and fundamental physics. How and Why do We Research Dark Matter? The quantum liquids behind MRI scanners and levitating trains. What are Gravitational Waves and How do We Detect Them? Why should students have all the fun? Jaw dropping lab demos from amazing to simply spectacular. A CalDay favorite! * Specifically designed for prospective freshmen and transfer students interested in the physics major. ** Get your Science@Cal passport stamped at these activities. 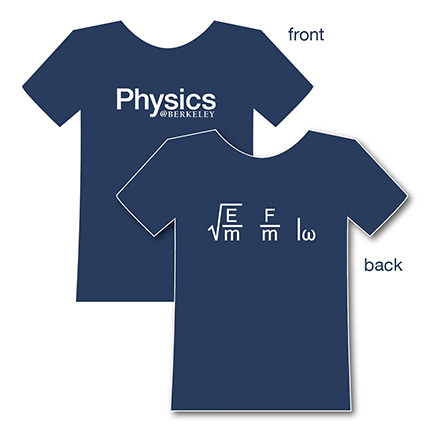 Physics tee shirts will be on sale in the lobby of LeConte Hall. Read more about CalDay 2019 on the Berkeley campus.